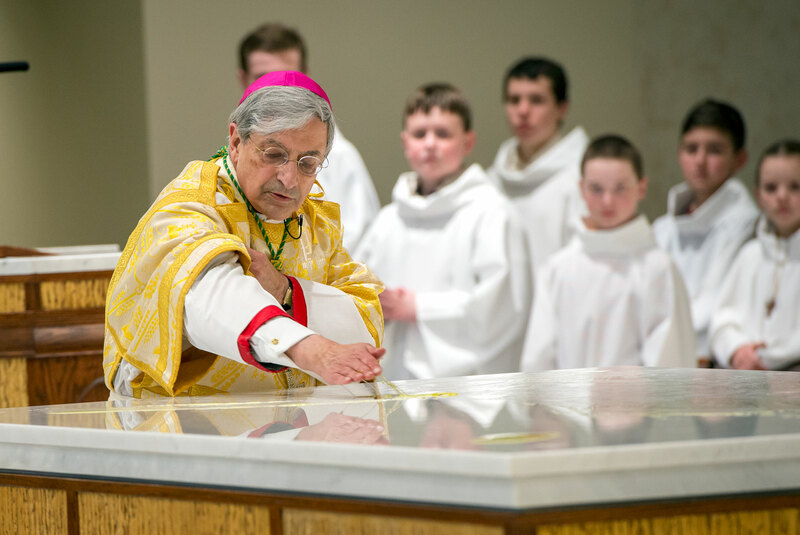 Bishop Salvatore R. Matano anoints the altar with oils during the Solemn Mass of Dedication at the newly built St. Pius Tenth Church in Chili March 19. 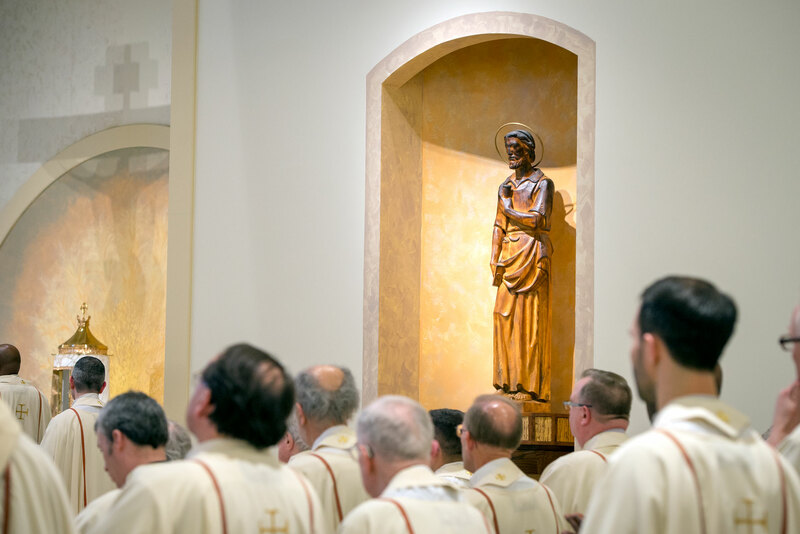 On March 19, the Solemnity of St. Joseph, we celebrated the dedication of the new St. Pius X Church in Chili. As you recall, the previous church was destroyed by fire on New Year’s Day in 2015. Such an event could destroy the spirit of a parish, but such was not the case for the good and faithful parishioners of St. Pius X Parish. 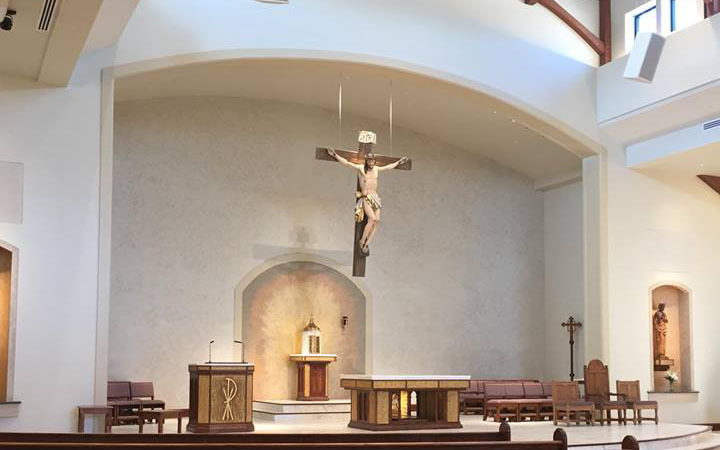 Under the guidance of their parish priest, Father Paul A. Bonacci, the parishioners immediately began the task of rebuilding the parish facilities. 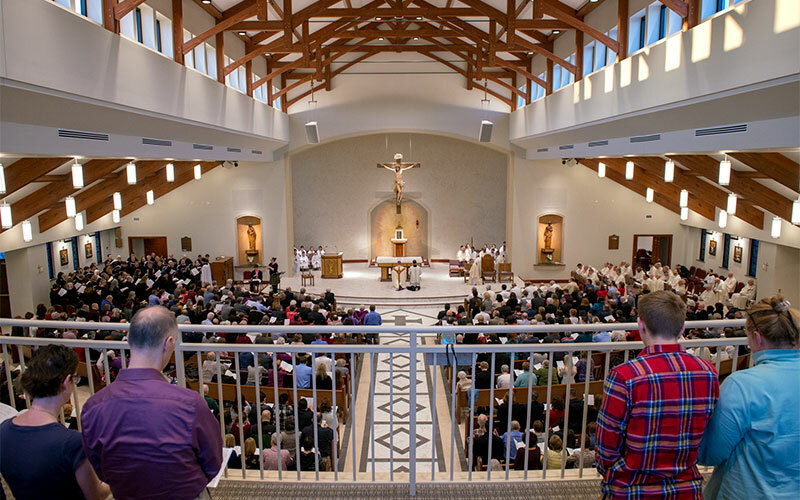 The parish center, also damaged by the fire, was first attended to in order to provide a new location for the celebration of Holy Mass and the sacraments. And so, we dedicate joyfully to your majesty this house of prayer, built by human labor. Here is foreshadowed the mystery of the true Temple, here is prefigured the heavenly Jerusalem. For you made the Body of your Son, born of the tender Virgin, the Temple consecrated to you, in which the fullness of the Godhead might dwell. St. Pius X will now begin new memories in this church of those baptized in Christ, beginning their life with Him. And on this journey with Christ to that heavenly Jerusalem they will be nourished by the Most Holy Eucharist at Holy Mass celebrated within these hallowed walls. Parents will be filled with joy as they see their children receive Our Lord in Holy Communion for the first time. And when one stumbles along the way, in this holy place the merciful Christ will gently pick up His children in the Sacrament of Reconciliation. Here God’s sons and daughters will be united in the Holy Sacrament of Matrimony, as spouses pledge to love and to honor each other all the days of their lives. In this House of the Lord, Jesus will be adored, prayers from the heart will be raised up to Jesus and pleas will be made that He help us shoulder our earthly crosses. Moms and dads will pray for their children, and children for their parents. Husbands and wives will pray for each other; the heartaches and challenges of life today will be placed in God’s hands; and the Lord will be asked to dispel confusion, console the sorrowful and embrace the poor through the good works of this parish. My house shall be a house of prayer, says the Lord: in that house, everyone who asks receives, and the one who seeks finds, and to the one who knocks, the door will be opened. 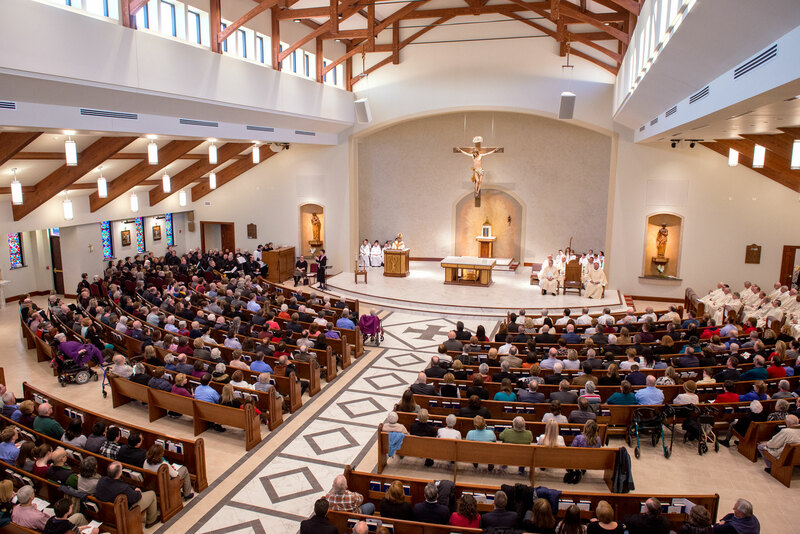 The building and dedication of a church is a very powerful example for our young people, who see the faithful come together to make great sacrifices and personal donations of time, talent and treasure because of their faith in God. I am confident that the youths of St. Pius X Parish have joined in praying and working for this important moment in the history of the parish. Indeed, in the years ahead I pray that they always will embrace this treasure being handed on to them and make God’s House their home. Many confirmation ceremonies now are taking place during the Easter season, with God’s gift of the Holy Spirit being conferred upon our young men and women. Once again, I pray that they will continue to remain strong in the faith with the support of their parents, sponsors and the parish communities. Our young people are growing up in a very complex world, which, despite extraordinary scientific and technological advances, has yet to build a world at peace, whether globally, nationally or locally. Without an active and intentional faith in God, we lack the necessary foundation to create a society that reverences and respects all human life, eradicating the violence that plagues us daily. Responding to this cultural shift that does not acknowledge the need for God, the Congregation for the Doctrine of the Faith, with the approval and guidance of Pope Francis, on February 22 of this year issued the letter Placuit Deo (It Has Pleased God): To the Bishops of the Catholic Church On Certain Aspects of Christian Salvation. The letter underlines two tendencies of modern society: neo-Pelagianism and neo-Gnosticism, which find their origins in the ancient heresies of Pelagianism and Gnosticism. Pointing out that “Pope Francis, in his ordinary magisterium, often has made reference to the two tendencies,” the letter then defines them. “A new form of Pelagianism is spreading in our days, one is which the individual, understood to be radically autonomous, assumes to save oneself, without recognizing that, at the deepest level of being, he or she derives from God and from others. According to this way of thinking, salvation depends on the strength of the individual or on purely human structures, which are incapable of welcoming the newness of the Spirit of God. On the other hand, a new form of Gnosticism puts forward a model of salvation that is merely interior, closed off in its own subjectivism. In this model, salvation consists of improving oneself, of being ‘intellectually capable of rising above the flesh of Jesus toward the mysteries of the unknown divinity’” (Placuit Deo, no. 3). Noting these prevalent trends in society, it is imperative that the church return to the zeal, fervor and enthusiasm of the early church “and every tongue confess that Jesus Christ is Lord, to the glory of God the Father” (Philippians 21:11). It is this confession of faith that has raised up a new parish church in our midst. Likewise, our own confession of faith, shown by our faithful participation in the life of the church, will support our candidates for the reception of the sacrament of confirmation. In doing so, we provide for the deepest yearnings of the human heart. “No created thing can totally satisfy us, because God has destined us for communion with Him; our hearts will be restless until they rest in Him” (Ibid, no. 6). Through these holy gifts we have received, O Lord, we pray, instill in our minds an increase of your truth, so that we may constantly adore you in your temple and glory in your sight with all the saints.